The politicization of religion is a nuisance. Unfortunately, it is often less than clear what counts as politicization when you get started. The bad news is that Islam will soon be able to enforce submission-conversion at the point of a nuke. The good news is that any religion that needs to do that is, by definition, a weak one. More than that, the fierce faith of the 8th century Muslim warrior has been mostly replaced by a lot of hastily cobbled-together flimflam bought wholesale from clapped out European totalitarian pathologies. It would have struck almost any other ruler of Persia as absurd and unworthy to be as pitifully obsessed with Holocaust denial as President Ahmadinejad is: talk about a bad case of Europhile cultural cringe. But in today's mosques and madrassahs there is almost as little contemplation of the divine as there is in the typical Anglican sermon. The great Canadian columnist David Warren argues that Islam is desperately weak, that it has been "idiotized" by these obsolescent imports of mid-20th century Fascism. I'm not sure I'd go that far, but, if Washington had half the psy-ops spooks the movies like to think we have, the spiritual neglect in latter-day Islam is a big Achilles' heel just ripe for exploiting. To this one might ask, "weak in what sense?" We know from many decades' experience that the Stockholm Syndrome can turn submission based on fear into submission based on conviction. The answer Steyn's piece implies is that Islamist Islam has been drained of the content that might form the basis of conviction. Violent Islamists go to mosques, according to this view, in order to have their political and social views reaffirmed, in rather the way that some people go to liberal churches in order to hear their progressive politics preached to them. Maybe this is true, but we should recall that the liberal denominations in the West have been losing members for two generations. As one wag put it, why go to hear a in sermon on Sunday what one has read over breakfast on the editorial page of The New York Times? Conservative denominations have been gaining adherents, but their conservatism is theological rather than political; to the extent these denominations support a political view, that support is a side effect. Perhaps Steyn is suggesting that Islamism collapses when submission can no longer be enforced at gunpoint. The problem with that hypothesis is that it fits badly with the fact that the idiotized Islam to which Warren refers works best in its Western colonies, where the state, as yet, gives no coercive support to Islam. The more interesting possibility is that Islamism might awaken spiritual needs that it cannot satisfy. In that case, Islamism might be like the Hindenburg: a huge and impressive vehicle that could explode in a shower of apostasy (presumably through conversion to Christianity) given a little encouragement. If you look into the void intelligently, the void will look back at you intelligently. Web searches have a similar quality. If you insist on finding a statistic online, even a statistic that could not possibly be compiled, the Web will give you a number, such as this assertion that 660-plus Muslims an hour are leaving Islam. That link is, actually, more interesting as a gateway to sources for the evangelization of Muslims. The subject is scarcely new: the Time Magazine cover story for June 30, 2003 was Should Christians Convert Muslims? My own answer to that question is "Yes, obviously!" I am particularly ashamed of the reluctance of Catholic institutions to become involved in evangelization efforts. However, I am also aware that pursuing such a policy for reasons of geopolitics is to do so for the wrong reason. Evangelization conducted for any purpose other than the good of the prospective convert is likely to have ironic results. One such result, for instance, might be the creation an idiotized, synthetic parody of religion; a Christian version of Islamism might be just as much of a nuisance as Islamism. We hear now of Christian undergrounds of recent converts in Muslim countries. This is unprecedented. It was notoriously the case for centuries that Muslims almost never converted. If this trend continues, it is likely to do so because it is nobody's policy. 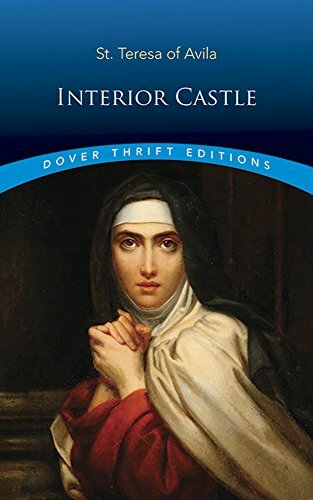 This luminous review of St. Teresa's The Interior Castle finally brings me full circle, back to the mysteries of human experience, and the unity of mystical experience across religions. [T]he spiritual marriage with our Lord, where the soul always remains in its center with its God. Union may be symbolized by two wax candles, the tips of which touch each other so closely that there is but one light; or again, the wick, the wax, and the light become one, but that one candle can again be separated from the other and the two candles remain distinct; or the wick may be withdrawn from the wax. But spiritual marriage is like rain falling from heaven into a river or stream, becoming one and the same liquid, so that river and rainwater cannot be divided; or it resembles a streamlet flowing into the ocean, which cannot afterwards be disunited from it. This marriage may also be likened to a room into which a bright light enters through two windows--though divided when it enters, the light becomes one and the same. The spiritual marriage is an event that occurs in the Seventh Mansions of the seven-region structure of the soul described in this book by Teresa Sánchez de Cepeda y Ahumada (1515 -- 1582), the reforming Carmelite nun. She was later named a saint and a Doctor of the Church; she is best known as St. Teresa of Avila. The state she described is the best thing that can happen to a living human being. The contemplative tradition of prayer in which Teresa is such an eminent figure prescinds from most late-modern discussions about the reality and nature of the divine. God is not a proposition to be proven; or even an object of faith, at least after the first stage of prayer as self-initiated meditation. Rather, God is known through direct experience, an experience that is prior to any philosophical or scientific glosses that students of contemplation might apply to it. In that sense, contemplative prayer is an existentialist enterprise, rather like Heidegger's study of conscience as the voice of Being. The difference is that modern existentialism appeals to immediate experience on the assumption that experience will always behave itself. In the world of the contemplative, experience does not behave itself at all. Be that as it may, any class of phenomena that are predominantly mental is going to raise at least some suspicion of insanity, fraud or mistake. Teresa reminds us more than once that she suffers from headaches, and that she sometimes hears a sound like rushing waters. There were points in her spiritual life, she makes clear, when she was simply ill. Critical of her own experience, she offers readers frank cautions about the psychological pathologies to which the nuns of her Order are subject. ("Melancholia" is not a modern diagnosis, but it seems at least as useful as later terms have proven to be.) She has a quite lively sense of the power of wishful thinking. She evidently knows mere silliness when she sees it. She also warns that even the most dramatic psychological event can be a diabolical deception, or may simply have no deep significance at all. Readers of her book will soon appreciate how disciplined her treatment of contemplation is. They will also appreciate that quite a lot of this discipline is external. Throughout her career, Teresa's activities were impeded because she was a woman in a society where women had limited legal personality, and, in any case, were not expected to have serious intellectual interests. Teresa was the daughter of a converso family, which also made her an object of suspicion in 16th-century Spain. More important, she and her colleague in the male wing of the Carmelite Order, Saint John of the Cross, were continuing to cultivate a tradition of late medieval spirituality that the Spanish hierarchy of her day strongly suspected, not without reason, to have contributed to starting the Reformation. Teresa was periodically suspected of being one of the alumbrados, a mystical movement whose beliefs shaded into antinomianism. For a variety of reasons, then, Teresa had protracted problems with the Inquisition and her own superiors. In fact, in 1577, when this book was written, her access to religious texts and even her own earlier works were restricted; when she makes a Biblical quotation, she warns that she may have misremembered it because she cannot look it up. Nonetheless, it says something for her general mental health that she proved to be a formidable bureaucratic infighter. She managed to keep her major works in circulation, and she co-founded the Discalced Carmelites, a branch of the 12th-century Carmelite Order, that remains an important institution in the 21st century. The time which has been spent in reading or writing on this subject will not have been lost if it has taught us these two truths; for though learned, clever men know them perfectly, women's wits are dull and need help in every way. Perhaps this is why our Lord has suggested these comparisons to me; may He give us grace to profit by them! Leaving aside the question of which two truths were at issue, there are several ways to view this passage. Maybe it is a simple expression of humility. Maybe it is a way of deflecting possible criticism from suspicious prelates. There is also some reason to suppose that Teresa was the snarkiest Doctor of the Church since Augustine. We should note that nowhere does Teresa suggest that the contemplative path is necessary for salvation, or even peculiarly helpful for it. Neither does she make special claims for her model of the soul as a castle like a translucent crystal. Nonetheless, for those who found the analogy helpful, she suggested that those who wished to advance in the knowledge and experience of God could think of themselves as moving through a concentric system of six rings of rooms or mansions ("moradas") toward a seventh, central set, where God was most perfectly present. Each of these rings of mansions presented its own challenges in terms of personal reformation and the type of prayer that is possible there; also, in each successive ring God affects the seeker in a more dramatic and overwhelming way. After the inner sections, particularly after the Fourth Mansions, God is clearly controlling the advance, but grace of some kind is needed for every step, including the original decision to enter the Castle. Outside the castle is a dark landscape, where poor sinners are preyed upon by "reptiles," which may be demons, or the temptations, or the sinners' own ill will. Entering on the spiritual life, the penitent comes to the First Mansions. There, with some suffering, he gains self-knowledge. This painful process is necessary, though these mansions are a relatively crepuscular region, where the assaults of the reptiles are still common. The Second Mansions are similarly dark and dangerous, but there the aspiring soul will first learn how to pray. In the Third Mansions there is less danger from the cruder assaults of evil. It is the region of ordinary virtue; continuance in a state of grace becomes easier. Though we are not told this explicitly, one might gather from the text that these are the Mansions where the faithful in secular life might ordinarily expect to spend their lives. In any case, even in these first three sets of Mansions, one meets here some of the subtle dangers of the spiritual life. Teresa counsels her readers on dealing with aridity and distraction in prayer, and about indiscreet zeal, the temptation to judge and criticize persons who seem less pious than oneself. The denizens of the Third Mansions in particular are tempted to think their lives are saintly because they are irreproachable; such people can actually benefit from the humility that comes with misfortune. In the first three Mansions, the aspirant soul may sometimes be aware of special manifestations of divine grace, and of peace in prayer. As a rule, though, the divine is experienced only through the ordinary means of preaching and the sacraments, and through the natural satisfaction in a job well done (if you are a contemplative nun, the distinction between liturgy and labor tends to disappear). The Fourth Mansions, however, are the point where "consolations" normally begin to play a large part in the spiritual life. There are moments of the "expansion of the heart" that are outside the normal range of emotions; and indeed, in some manifestations, outside the range of nature. The first three Mansions of the Interior Castle correspond with the first water, or the prayer of Meditation. The Fourth Mansion, or the prayer of Quiet, corresponds with the second water. The Fifth Mansion, or the prayer of Union, corresponds with the third water. The sixth mansion, where the prayer of ecstasy is described, corresponds with the fourth water. As for the Seventh Mansions, this review begins with a description of the spiritual marriage that occurs there. The present text assumes that the reader is familiar with these modes of prayer and how they are performed. Meditation, for instance, seems to mean principally the sustained contemplation of the incidents in the life of Christ or of the Passion; the Rosary is a prayer of this type. In the other forms of prayer, some voluntary recollection or other act may be necessary, but the higher forms are events in which the will of the aspirant plays a smaller and smaller role. In any case, this book is less concerned with how to pray than with how to handle prayer's effects. The theological subtext of The Interior Castle is Thomistic. Teresa was not herself trained in systematic theology, however, and even by her own account she garbled some points. This text has editorial notes and an interpolated chapter to clarify these points. Thus, they amplify with a venerable Scholastic gloss her distinction between the prayer of Union, which occurs in the Fifth Mansions, from the Marriage that occurs in the Seventh Mansions. The prayer of Union, the monks suggest, involves the accidents of the soul (its senses and cognitive functions), while the Marriage involves a change of its substance. 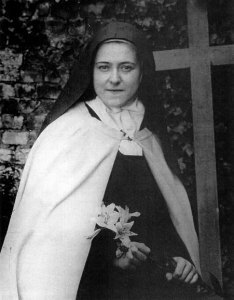 This change is a transformation that identifies the soul with the divine to the degree that Teresa has a vision in which Jesus says to her "that henceforth she was to care for His affairs as though they were her own and He would care for hers." In the spiritual marriage, a human life becomes Christ's life. The editors do not make quite so bold as to call this transubstantiation. Note that this was an "interior vision." Teresa describes "imaginary visions," which occur when people see images as if they were physical objects. She does not say such things are impossible, but that they do not belong to her experience. She also describes raptures, in which the spirit feels itself to leave the body (the she is professedly agnostic about whether this is actually the case). She also describes "jubilees," which can involve more than one person, and which sound a bit like charismatic behavior. Until she gets to the dramatic (and apparently somewhat dangerous) ecstasies of the Sixth Mansions, she herself is far more comfortable with "intellectual vision," in which knowledge is infused directly into the intellect, without the intervention of the senses. This can involve a direct awareness of an object or person, including the physical appearance. Indeed, one of the greatest consolations in the more advanced Mansions is the repeated and even habitual awareness of the divine presence. This does not mean that all the writers say the same things about the same experiences, or even that it is certain that the experiences are the same. For instance, in The Interior Castle, Teresa speaks of a point where a word, an idea, any small thing will cause an eruption of the divine presence. The divine sends out a flurry of sparks, any one of which could cause the soul to ignite. This sounds a bit like the climax of the anonymous English work, The Cloud of Unknowing, from two centuries earlier. In that book, the prepared soul sends out, at unpredictable intervals, shafts of aspiration that pierce the Godhead. Similar to The Interior Castle, yes: but are these moments identical? There are certainly points where Teresa takes care to distinguish her views from those of other writers. There are some texts that suggest there comes a stage in the seeker's journey when the whole object of attention is God without qualification; the earlier meditations on Christ and His Passion were necessary, but are no longer relevant to the final stages. That is the view of The Cloud of Unknowing, which demands a preparation of perfect faith and purity of life, but moves to a point where everything, including even the benefits conveyed by God, is neglected in favor of the love of God. Teresa says that this is not her experience; she never ceases to focus on Jesus and the Cross. She never forgets the Saints, who at this level become felt companions rather than merely recipients of prayers for intercession. The Interior Castle presents a world that is less arid and alien than other expressions of advanced spirituality, particularly those of the 20th century. Finally, we may note that the seven-part structure of the Castle makes the journey through it into a history of seven ages, which inevitably calls to mind some of the models of time based on the structure of the week. The spiritual marriage of the Seventh Mansions calls to mind the Millennium, an idea that might have a literal personal application even if it does not have a historical one. More speculatively, one of Teresa's best-known metaphors, that of the caterpillar that spins a cocoon and later dies to be reborn as a butterfly, might have an application not just to the aspiring soul, but also to the Incarnation. The cocoon begins to be spun in the Fifth Mansions, after a long history of preparation. This is not unlike the idea that the Incarnation is the center of history, structurally if not necessarily in terms of the duration of the time periods to either side. Even if Teresa had any thoughts along these lines herself, she does not mention them in The Interior Castle. They are the sort of notion that made the Inquisition cranky, for one thing. For another, speculation was not Teresa's vocation. She wrote about only what she knew. The basic demographics of religion across the world remain unchanged from twelve years ago. Often enough, books on important topics are published almost simultaneously with historical events that discredit them. This book, on the future of world Christianity, and not least on the likelihood of conflict with Islam, is a rare exception. It went to press in September of 2001, so it did not mention the attacks of that month on the World Trade Center and the Pentagon. The author, Philip Jenkins, is a professor of Religious Studies at Pennsylvania State University. He did not add references to those events in subsequent editions. He did not need to. Though one might quarrel with many parts of his analysis, the intervening years have seen nothing to undermine his basic thesis that the position of Christianity as the world's largest religion will only improve in the 21st century. The fascinating question is how different world Christianity will be from the Christianity of the era of European predominance. Christianity began as a Near Eastern religion. The bulk of the world's Christians may have been European no earlier than the 11th or 12th century. The latest configuration, in which most Christians live in Latin America and Africa and East Asia, is sometimes called “The Third Church,” though one hopes that Jenkins's “Next Christendom” sticks. If demographics are destiny, then people who foresee a Muslim future are simply mistaken. Christianity is well represented in the countries with the fastest-growing populations. Indeed, it always has been. In 1900, at the height of the European empires, perhaps a third of the world was Christian, just as a third of the world's population was European or of European extraction. Today, when a majority of the world's Christians already live outside of Europe and of America north of the Rio Grande, the Christian percentage of the world is still about a third. Projections have it that the percentage should also be at least a third in 2050, despite the high growth rates in Muslim countries, and despite the demographic declines, sometimes in absolute terms, of the developed countries. The author gives a great deal of attention to Africa in particular. We get lots of tasty statistics. Apparently, just 10% of Africans were Christian in 1900. The portion grew to 25% by 1965, about the time that Christians began to outnumber Muslims. By 2001, it was perhaps 46%. “In American terms,” he explains, “much of the continent has served as one vast burnt over district.” (He refers, of course, to the region of western New York State that produced so many new religious movements in the first half of the 19th century.) He does not neglect the AICs (“African Independent Churches,” though that acronym has more than one interpretation.). He points out that, however interesting the AICs may be, the big story is the continuing vitality of the mainstream denominations, particularly those that have become little more than museum curiosities in Europe. In general, one might characterize the Christianity of the South (which, oddly, includes the East) as visionary, charismatic, apocalyptic. At the same time, it is also theologically and culturally conservative. The tension is real: not just in the North, but also in the South, people ask, “What is essentially Christian?” There is an ancient tradition of using the cultural resources of pagan societies for the purposes of evangelization. Europe itself was converted in part by the missionaries' willingness to regard the native mythologies as “preparatio evangelica.” On the other hand, there is no denying that intelligent inculturation of the faith can lead to unacceptable syncretism. Regarding the last point: I have heard that talk, too, all of it from old-style traditional Catholics. Even if it were theologically possible (and certainly a redefinition of the Trinity would not be), I just don't see the market. In any case, Jenkins notes, no doubt correctly, that many of the peculiarities of Southern Christianity are simply aspects of its newness. Prophets may prophesy today, but in due course they will be replaced by ecclesiastical bureaucrats who write memos, even in Africa. Indeed, the famous social conservatism of the South may pass away, too. However, this will not happen for generations. ---Much of the world is becoming urbanized in chaotic megalopolises The displaced people there need communities, and services that the government cannot provide. ---In the new Christian groups, members of disfavored races and castes can become leaders. Women are somewhat less likely to become leaders, but they become the core members. ---Men learn family responsibility and chastity. ---People can experience the presence of God in everyday life. Among the topics that figure most prominently in contemporary conversion narratives are physical healing and emancipation from various addictions. Jenkins cites repeatedly Harvey Cox's noted study of the worldwide spread of Pentecostal worship, Fire from Heaven. By Pentecostalism he does not mean principally the self-identified Pentecostal denominations, important though those are. More important may be the spread of this pluripotent spirituality through the older denominations. If present trends continue, there will be a billion Pentecostals, variously defined, by 2050. That number will be comparable to the number of Hindus. Catholics will, the author reminds us, outnumber both, but he suggests that the rise of Pentecostalism may have been the most important event of the 20th century. In Latin America in particular, it is becoming almost a third limb of Christianity. It is also an object of suspicion to many Protestant denominations, who look askance at its reliance on personal revelation and on its destitute audiences. The author does not cease to remind us of the parallels between our time and that of the period just after the fall of the Roman Empire, when the Greek Christianity of the eastern Mediterranean was transmuted in the forests of northern Europe. 21st century Christianity is becoming the ghost of the European empires, just as medieval Christianity, in Hobbes's famous metaphor, was the ghost of the Roman Empire. It was not so long ago that progressive churchmen placed high hopes in theologies of liberation as the cutting edge of revolutionary reform in the South, and particularly in Latin America. Jenkins makes the important point that the embrace of socialism by sophisticated Southern Catholics dovetailed neatly with the older tradition of integralism. In any case, during the 1970s and 1980s, the Catholic Church often did serve the political interests of the poor. Clerics were martyred, and others became genuine democratic leaders. Popular religious movements did spring up. Unfortunately, as the saying goes, “The Church chose the poor, and the poor chose the evangelicals.” There certainly were cases in Latin America, as in Africa, where oppressive governments turned to charismatic and quietist groups in order to circumvent the traditional churches and their new social radicalism. In general, though, Liberation Theology was seen as a northern artifact, essentially irrelevant to the spiritual and social needs of the people. On the whole, Catholic charismatic groups have been more important than the “base communities” so favored by the religious Left. Not unreasonably, the author reminds us again and again how surprising this resacralized world must be to Westerners who grew up assuming that secularization was the irreversible direction of history. However, he also reminds us that the reversal is not unprecedented: consider the revival of both orthodoxy and religious enthusiasm in the 19th century, just after the secular Enlightenment seemed to be carrying all before it. Jenkins does not present a single scenario for the future. Rather, he tosses off one and then another, like a screenwriter proposing multiple ideas for disaster movies to a film studio. One can imagine future North-South conflicts, created by maldistribution of wealth, but expressed in literally apocalyptic terms. In the long run, the greater threat to McWorld may not be the Jihad, but the Crusade. The North could eventually define itself against Christianity. Jenkins makes a few points about other religions. Hindu chauvinists have been almost as oppressive toward Christians as Muslims have been, but that is partly because Hinduism is vulnerable: the huge Dalit (Untouchable) caste in India could benefit enormously from conversion to either Christianity or Islam. The eclipse of Buddhism, Jenkins says, is historically anomalous and probably temporary. Regarding Judaism, he notes that the Next Christendom has more freedom than the North to turn against Israel, because the South feels no responsibility for the Holocaust. On the other hand, since Israel has often aided Christian minorities being oppressed by Muslim governments, Israel could be counted among the crusaders. Jenkins constructs even stranger scenarios, such as one in which a still agnostic Chinese government comes to the aid of ethnic Chinese Christians in Malaysia or Indonesia, whose Muslim governments are supported by the United States. There is a long tradition on both the Right and Left in developed countries of using the South for rhetorical purposes. A generation ago, the radical Left said that political battles that were lost in the West would be won in the South and East. Now Conservatives are saying the same thing. The world's multiculturalists are discovering, to their horror, that they have in fact been fostering a planetary religious revival. 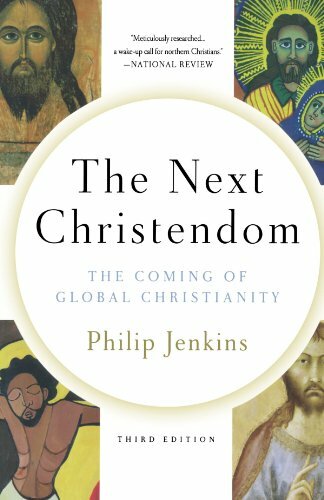 Still, Jenkins is clear that Western conservatives no more control the Next Christendom than the Old Left controlled aggressive international communism. The Right will probably be just as surprised at what actually happens as the left ever was. I don't think I can improve on this concluding paragraph. Remember back in 1993 when First Lady Hillary Clinton began to wax eloquent about The Politics of Virtue? Remember that you could not understand what she was talking about? Because she and her husband had picked up a lot of the vocabulary for their new enthusiasm from Tikkun magazine, its editor, Michael Lerner, was briefly designated White House Guru by members of the press. In this book, Dr. Lerner (he holds doctorates in philosophy and clinical psychology) tries to explain what the First Lady was talking about, or at least what she would have been talking about if she had understood the magazine better. This is scarcely a campaign book; only an Epilogue deals with the Clinton presidency at length, and that critically. Rather, the book is nothing less than an attempt to sketch a general theory of leftist politics for a post-secular age. In fairness, it should be said that Lerner speaks of a "progressive" politics that "goes beyond Right and Left." However, as with so many other calls to go "beyond" those categories, Lerner seeks to do so by assuming unconditional victory for the Left on almost every controversial point. The book is most interesting for its critique of liberalism. Like Christopher Lasch, Lerner sees it as basically a servant of the market. The argument might have been more persuasive were it not for the repetitive psychobabble in which it is written. In any event, Lerner's psychoanalytical bent has unfortunate consequences that go beyond style. The author's critique of contemporary conservatism, for instance, fails to engage the ideas of its subject as anything but symptoms of the psychological distress inherent in a repressive social system. The real problem with the book is far more fundamental, however. Lerner seeks to reconstruct "progressive" politics around a spiritual core, but the fact is that late modern cultural liberalism is flatly incompatible with piety. One will eventually destroy the other. It is as simple as that. The author has two fears, one general and one more specific. The general fear is that the Right, both cultural and economic, will achieve permanent hegemony in the United States because it speaks to the spiritual dimension of life that liberalism has traditionally disparaged or ignored. Lerner is willing, indeed anxious, to acknowledge that the religious and cultural Right perceives real flaws in liberal society. However, since he is an economic leftist of the old school who has little sympathy with the actual program of today's Right, he is not pleased. Lerner uses a slightly repulsive term, "meaning-needs," to refer to this element missing from the mind of modernity, but his point is clear enough. No society worth living in can be grounded in pure procedure, even just and equitable procedures. Healthy societies must look to a transcendent point of reference. Traditional religions do this, though Lerner is careful to allow that the same function could be served by nondenominational metaphysics. When a society loses sight of the transcendent, he suggests, it becomes disoriented. Families fall apart, people hate their jobs, some people become literally ill, either physically or psychologically. Where people are not seen to be images of God, they soon become objects rather than subjects, and then hated objects. Lerner has a quite lively sense that this is precisely the kind of cultural world that secular liberalism, or liberal secularism if you prefer, has been creating since the Enlightenment, and that people naturally loathe it. His more specific fear is touched on directly only a few times, but the author clearly regards it as important. It is his belief that the Jews have been peculiarly associated with the progress of modernity, and so might be expected to be peculiarly subject to attack when modernity, at least in its liberal form, goes into retreat. This argument perhaps works better for continental European history than for American or even British history. Since the French Revolution, the "conservative" wing in the politics of most European countries has usually been based on an alliance of throne-and-altar, one to which non-Christians of any description were almost by definition in opposition. Even in the United States, however, the law regarding the separation of church and state was in large measure created to accommodate Jewish demands for purely secular public institutions, particularly with regard to education. According to Lerner, Jewish Americans are wrong to congratulate themselves on living in a country where most traces of Christianity have been removed from public life and the rest are under litigation. It is, for instance, conceivable that a resurgent Christian Right, which arose precisely to oppose this trend in the nation's civil life, would hold a grudge if it came to power. The more fundamental problem, however, is that secularization has been correlated with an appreciable decline in the public and private ethics of the American people. A godless America is not good for anybody, the Jews included. This account of the theses of "The Politics of Meaning" is a kind of translation, since the intended audience for the book lives in a special mental universe where people speak a special language. The people Lerner seeks to persuade are old New Leftists, people for whom the 1960s was the acme of the moral evolution of the human race. In that universe, corporations are assumed to be criminal enterprises and the people who manage them are on the moral level of muggers and rapists. In that universe, feminism is an unalloyed success whose methods of consciousness-raising and mass action are models for every other form of social change. In that universe, private enterprise is the chief danger to the ecological health of the planet. (This may be because in that universe socialism has not really been tried, so the layer of toxic soot that covers so much of Eastern Europe in our own world is no evidence.) Perhaps the most bizarre thing about this other universe is that, there, Wilhelm Reich is a great psychoanalytic thinker. (Indeed, Lerner bandies Reichian-sounding terms like "spiritual energy" and even "God-energy" so freely that you have to wonder how tightly his notion of the "transcendent" is screwed on.) The inhabitants of that other universe have interests different from those of the people we know. Lerner's argument in the book, in fact, has less to do with demonstrating the reality of the transcendent than with showing why the "politics of meaning" is necessary for the fight against capitalism. One of the many sixty-ish things about the book is that its attack on liberalism is from the Left. We are given to understand that the problem with the ACLU is that it is not radical enough. Lerner attacks the traditional liberal program of identifying and protecting ever more rights as essentially a diversion. "Rights talk," as it has come to be called, assumes the licitness of the market economy and seeks to make that economy more palatable. In fact, the whole problem with civil liberties as liberalism has conceived them is that they are based on the notion of contract, of free agreement between equal adults who have no history and no community. In order to disparage this notion, Lerner even goes so far as to nibble at the rationale for the abortion right, saying that abortion is a matter not just between a woman and her doctor, but a woman, her community and her doctor. (As I said, you have to wonder how tightly his notion of the transcendent is screwed on.) Lerner suggests an alternative model of rights, one proposed by certain feminists. Instead of thinking of rights as entitlements that flow from the implicit "social contract" between adults, we should think of them as arising from a social nurturing relationship like that which exists between a mother and child. My own reaction to this idea is that it gives new meaning to the term "nanny state," but in the universe where Lerner's audience lives, such a characterization is not an objection. Lerner's postulate that market economies dissolve the cultures of the societies in which they exist is not new, and I can see how a few years ago it might have seemed to be obviously true. Lately, though, many people have begun to wonder. Francis Fukuyama, for instance, has taken to assessing the developmental potential of different countries by assessing the level of certain virtues among their inhabitants. So many societies have attempted to build capitalist economies since 1989, and with such varying success, that you have to question the assumption that the market economy is a universal anticulture. Lerner, however, remains fixed in the undergraduate certitudes of thirty years ago. For him, business is just a kind of predation. Competitors are obstacles to be overcome, employees are tools to be expended, consumers are cattle for the slaughter. Now, there are indeed post-Communist countries were business really is a war of all against all, one fought with real bullets that leaves real dead bodies. And of course, managers even in sophisticated capitalist countries are sometimes possessed by strange fashions, such as the recent practice of downsizing companies even in the face of expanding markets. However, I think that one lesson we can learn from the events of the past decade, if we did not already know it, is that businesses are normal human associations that depend on such virtues as trust, loyalty and hard work. Furthermore, far from relentlessly destroying these virtues, they normally promote them. Successful market economies are culture specific phenomena that depend on the Post Office not stealing the mail, on accountants honestly totaling the receipts, on workers not sabotaging machines. Successful business pay their suppliers promptly. Their bosses look for new markets rather than try to bribe the government to give them monopolies. The sorry state of so much of the post-Communist world can be explained by the lack of cultural reflexes of this sort. Private enterprise does not run on "greed" or any other vice, though Lerner seems to think that greed is the sum of the morality of the market. Additionally, the notion that capitalist economies run on false needs generated by wicked marketers is an unsupportable piece of ancient leftist polemic. Doubtless most of the needs to which market economies cater are "false needs," in the sense that they far exceed the needs of bare subsistence. However, the fact that capitalist countries keep most of their citizens far above the level of bare subsistence can appear to be a fault only to people who hope for universal misery as a necessary predicate to revolution. There is a distinct Gnostic flavor to Lerner's belief that most people in advanced countries spend most of their days in the service of criminal enterprises. (He allows, of course, that the guilt of business executives, like that of drug dealers, may be mitigated by the warped social environment in which they grew up.) Just as the ancient Gnostics thought that the body was evil in itself and the world therefore the doomed kingdom of the devil, so Lerner regards the normal activities of everyday life with a sort of disgust, tempered by the hope that people will someday abandon their inhuman market practices and instead deal with each other in a humane and loving way. Lerner's model of truly human social interaction seems to be therapy. In the 1970s he was part of an institute dedicated to relieving the burdens of work-related stress. From what I can gather from this book, therapy consisted of awakening the workers to the harm that market competition was doing to their lives. The enterprise did not go far, and to his credit, Lerner realized that his clients had moral and spiritual concerns that could not be addressed in the language of the New Left or that of psychotherapy. 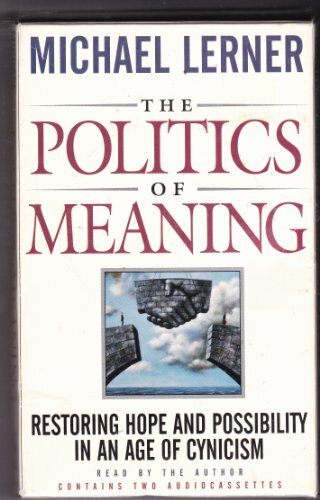 "The Politics of Meaning" is an attempt to outline a language that could be used for just such a purpose. The "democratization" of the economy (which seems to mean establishing markets and prices by vote) and the "humanization" of the workplace (which seems to mean the old Soviet model of folding social services into the operations of factories and offices) would not be undertaken to comply with some economic theory. That would be just as dehumanizing as market economics. Rather, the truly human society would be created through a process of healing. The cure is to be found in a reformation of consciousness, to be accomplished through the familiar means of group therapy and other tools of progressive politics. The key to a new society is a transforming knowledge, a gnosis. To focus on mere details is not just unnecessary, but an evasion of the task at hand. Tikkun, the name of the magazine that Lerner edits, means "reconstruction." In kabbalah, it means healing the damage done to the world by the primordial disaster that marred it. Traditionally, this was supposed to be accomplished by the devotion of the pious, but the idea lends itself to a theory of social progress as readily as does St. Augustine's model of history. The life's work of every participant in the society for which Lerner hopes would be to become a fully actualized human being, a creature that reflects the image of God. Nevertheless, the fact that the whole business sounds more than a bit like the Chinese Cultural Revolution with facilitators is not perhaps entirely coincidental. Lerner remarks at one point that "to be human is to be commanded." There is something to be said for this formula, if you believe that morality is objective. The problem is that he seems singularly unwilling to be commanded by scripture, tradition or history. There is no significant feature of America's own cultural revolution in the 1960s that he is willing to repudiate. Certainly no laws, like those relating to divorce or abortion, are to be changed. The only problem with homosexual culture for him is homophobia. Even his willingness to allow instruction about religion in the schools is tempered by the proviso that Christianity is to have no greater part in the curriculum than any other religion, an odd restriction in a largely Christian country, even from a purely academic point of view. One of his refrains is that we should not limit our thinking to the practical, but should try to implement our highest ideals. The problem is that in Lerner's case, the social ideal is a religiously observant kibbutz. In contrast, the ideal for most people most of the time has been their own house with a bit of garden. When most Americans actually got something like that after the Second World War, the Left derided the ideal with songs about "little houses made of ticky-tacky" and began trying to make people want what they are supposed to want. Michael Lerner is still at it. The lesson of the 1960s Lerner has refused to learn is perhaps the chief lesson of the whole revolutionary tradition of the modern West: we are commanded to be practical. To do otherwise, when contemplating so grave a matter as reconstructing a society, is to practice depraved indifference to human life. Lerner thinks that society as it exists is composed of criminals and psychopaths, of people who oppress each other and who steal valuable resources from the future. Nevertheless, he holds out the hope that they can be rehabilitated through a reeducation process in which they will have the sort of rights that children have in relation to their parents. Frankly, this has been the formula for bloody mass murder in so many places in the 20th century that it is hard to see how anyone who is not a moral idiot could propose it yet again. One of the important points about the linear model of history shared by Judaism and Christianity is that you are supposed to learn something as you go along. We learn about the world through induction, through planned experiment and everyday experience. This is how we derive meaning from history. It is how we get some inkling of the influence of the transcendent on our world. The rejection by modernity of this source of guidance is what made modernity what it is. Nevertheless, something we have indeed learned is that market economics is true as far as it goes. It is, after all, just a set of theorems about the interrelation of prices. We have also learned that the market is not what is wrong with the world, and that those who say that it is usually have an agenda for which economics is just an excuse. These small insights do not exhaust the meaning of the twentieth century. However, they must be the basis for any humane practical politics of the twenty-first. This article first appeared in the July/August 1996 issue of Culture Wars magazine. John's enthusiasm for alternative history is arguably going better than spelling reform. The kind of perfectly pleasant people who have no interest in religion John mentions near the end make me thing of Kipling, who described himself as a Christian God-fearing atheist. Lingva Prismo is a language-related site that is hosted by the German subsidiary of a Swedish PR firm. If you are interested in Esperanto, this might be a good place to start. I mention it here because this month's topic for discussion in the forum is the merits and demerits of spelling reform, one of my own pet projects. For Germans, this is not the exotic subject it is for English-speakers. German recently implemented a reform that apparently pleased nobody. Compared to English, of course, German spelling is a snap, precisely because the orthography has been systematically reformed several times in the past. (The same is true of almost all European languages.) However, the design and introduction of the most recent German reform seems to have created a case study in how to do it badly. Such misadventures are not without precedent, even in English. Is a successful reform ever going to happen in English? Yes, eventually. Resistance is futile. The signal has a rapidly fluctuating frequency, which could occur if it was beamed out from a rapidly spinning planet or object, although a planet would have to be rotating nearly 40 times faster than Earth to produce the same drift. A drifting signal would be expected to have a different frequency each time it was detected. Yet with every observation of SHGbo2+14a, the signal has started off with a frequency of 1420MHz before starting to drift - although this could be connected to the telescope. That sounds to me like the transient hum that old vacuum-tube radios used to make when you first turned them on, but then what do I know? The signal is likely to be a product of the equipment, or of some exotic but not intelligent astronomical object. Nonetheless, what struck me about this incident was how persnickety the SETI people are about which signals they find plausible. SETI has its own ideas about how they would make First Contact, and any alien who wants their attention will have to come up to their exacting standards. I have always been readier to believe that we might overhear an extraterrestrial civilization, such as the output from a solar-system-wide version of the GPS, than that we would find a beacon dedicated to First Contact. Our SETI does not plan on creating any such beacon; why should anyone else? The interesting thing about this passage is that the hypothesis it implies, that religion is a form of insanity, has been repeatedly falsified by research. Some degree of religious belief and practice has been shown to be an indication of psychological well-being. Personal experience is consistent with this result. I've known plenty of unpleasant religious people (you know who you are), but the only wild-eyed screaming lunatics I have ever met in this regard are fanatical atheists. There is another class of perfectly pleasant people with no interest in religion at all, but they have no relevance to the matter. I threw away my most recent issue of The Weekly Standard, so I can't tell you who wrote the long piece about Alternate History. (I continue to insist that Alternative History is a better term, because "Alternate" implies just two possibilities, but don't get me started.) However, introductions to the genre are popping up all over, such as the essay by Laura Miller in today's New York Times, entitled Imagine. Why this sudden mainstream interest in a kind of fiction that many people can't stand? The reason seems to be Philip Roth's upcoming novel, The Plot Against America, which should be published in October. The book's premise is that Charles Lindbergh is elected president in 1940. What happens thereafter I don't know. No doubt I will have to read the book, particularly if I can cage a copy from the publisher. In fact, if any of the book review editors who read this blog have a spare copy, please pass it along. You know who you are, too. John C. Wright wrote an interesting essay for SFSignal on religion in science fiction/fantasy works. I thought there was more substance to what he wrote than this thing I saw a few weeks back. I have read and enjoyed many of the books Wright referenced in his essay, so I think I appreciated it all the more. However, two of my favorite authors didn't get a mention. The first, Jerry Pournelle may not have got a mention because he doesn't write any of the kind of stories that Wright primarily is talking about. However, Pournelle has a much more accurate take on religion than most scifi/fantasy writers, and that is one of the reasons I like him. Religion can often be a real factor in his stories, and being historically minded, Pournelle usually just uses real religions. One of the first books of his I ever read, King David's Spaceship, was set in a future history that Pournelle and Niven invented, and 4000 years in the future, there were still Christians and Muslims acting much as they do now. In fact, the Catholic Church is still there, having outlasted two space empires that went through civilizational cycles ala Spengler. Tim Powers probably just breaks the mold, telling stories that often involve the mythical pantheons typical of low fantasy, but with the numinous background of high fantasy. He and Neil Gaiman are sometimes blamed for the fact that we call it scifi/fantasy instead of separating the two. Wright also mentions Clarke's Childhood's End, which is a book I have never read, but I am nonetheless familiar with due to the nefarious influence of John Reilly. Childhood's End is a millennial story, so it rates a mention in any discussion of the millennium in fiction. Most Gnostic parables of the sort Wright mentions are millennial, but Childhood's End is better than most, and deservedly more famous.